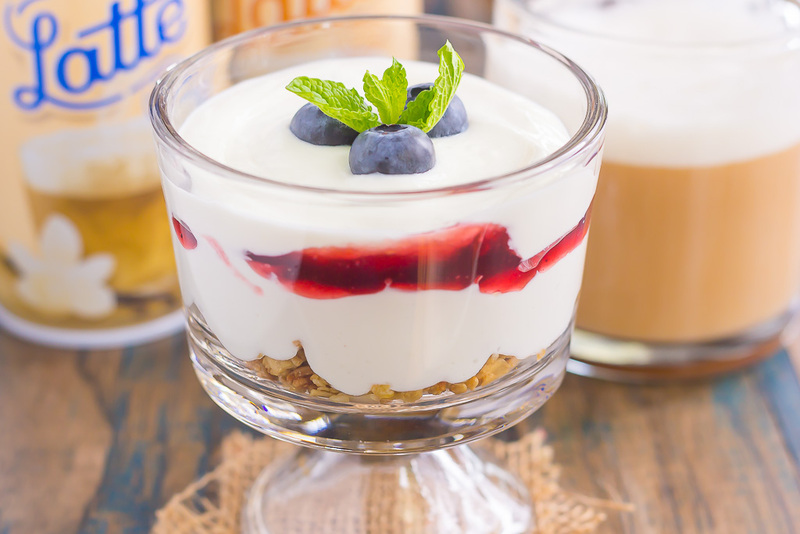 This Blueberry Cheesecake Breakfast Parfait is the best way to start the day. Vanilla Greek yogurt is infused with cream cheese and then layered with blueberries for the ultimate parfait. 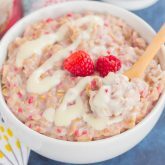 Light, creamy, and packed with flavor, this easy breakfast or snack is perfect for everyone! Every day needs to start with coffee. Well, if you’re a coffee drinker, that is! And I sure am! If you follow me on Insta-stories (through Instagram) or Snapchat, you know that I always share my ‘flavor of the day’ when it comes to my coffee. I love my Keurig, and I’m always stocking up on the newest flavors that I can find. It gets my day off to a great start and just makes me happy. Do you know what else makes me happy? International Delight® One Touch Latte™. I stumbled across this at Walmart and couldn’t wait to try it! It’s the very first frothing coffee creamer that is sure to be a hit with creamer lovers everywhere. It turns a regular cup of coffee into a sweet and creamy, fabulously frothy , foam-topped latte. 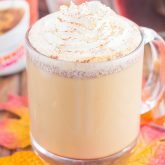 International Delight® One Touch Latte™ sweetens, creams, flavors, and froths, all in one! With flavors like Vanilla, Caramel, and Mocha, you can make a flavorful, coffeehouse-style latte in seconds. It’s so easy! Simply fill your mug 2/3 with coffee, shake the International Delight® One Touch Latte™, press and hold for 5-7 seconds. And that’s it! You can get 7 uses out of one can and it’s a great value for a delicious, at-home latte. And since Mother’s Day is almost here, I thought this would be the perfect opportunity to celebrate Mom with a home-made latte and a breakfast treat. After all, moms deserve the very best on their special day. And even though my mom lives a few states away from me, I know she’ll be enjoying the day with her favorite coffee, too. 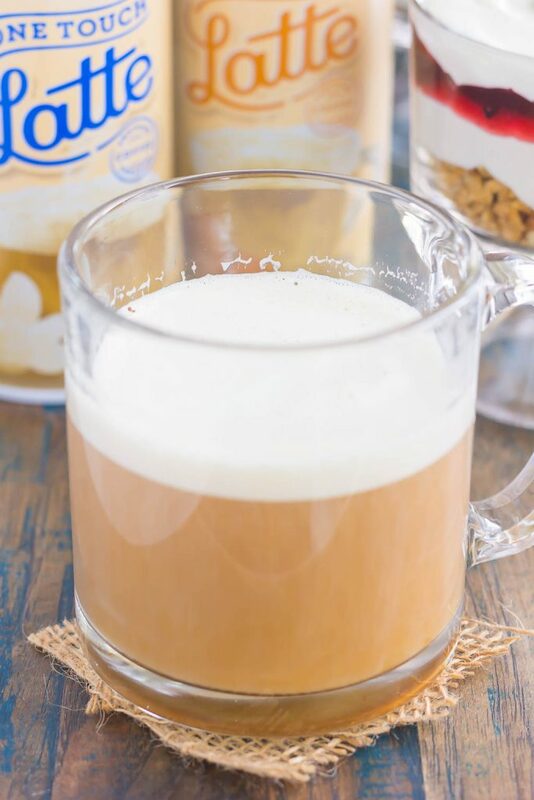 After stocking up on International Delight® One Touch Latte™ Vanilla and Caramel flavors, I headed home to whip up this easy breakfast parfait that pairs perfectly with a homemade latte. 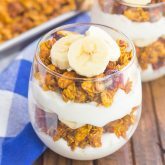 If you’re searching for that easy, yet impressive treat for Mother’s Day, this simple breakfast parfait will hit the spot! Because the Greek yogurt is combined with rich cream cheese, it gives the flavor a delicious boost, but it makes it a healthier way to enjoy cheesecake! And instead of using traditional graham crackers for the crust, I used granola instead. It gives this parfait the perfect crunch. And those blueberries. I used blueberry jam as the ‘filling’ of the cheesecake, and also added some fresh blueberries on top. 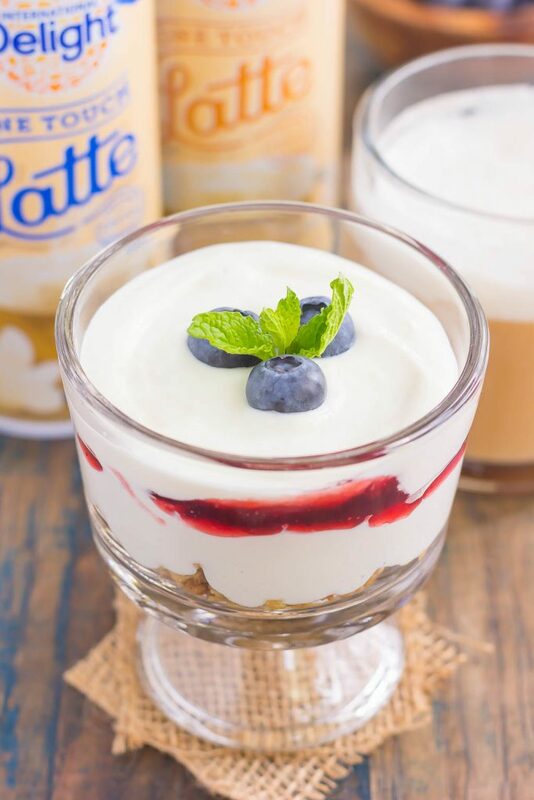 It gives these Blueberry Cheesecake Breakfast Parfaits the finishing touch! Like most of my recipes, this breakfast parfait is a breeze to whip up. That means you can have this dish prepped and ready to be devoured in less than 10 minutes. Simply combine the Greek yogurt and cream cheese until light and fluffy. Spoon it on top of some crunchy granola, swirl in some blueberry jam, and then add another layer of the yogurt cheesecake batter. Top the parfaits with a few blueberries and a sprig of mint, and your parfaits are ready to enjoy. 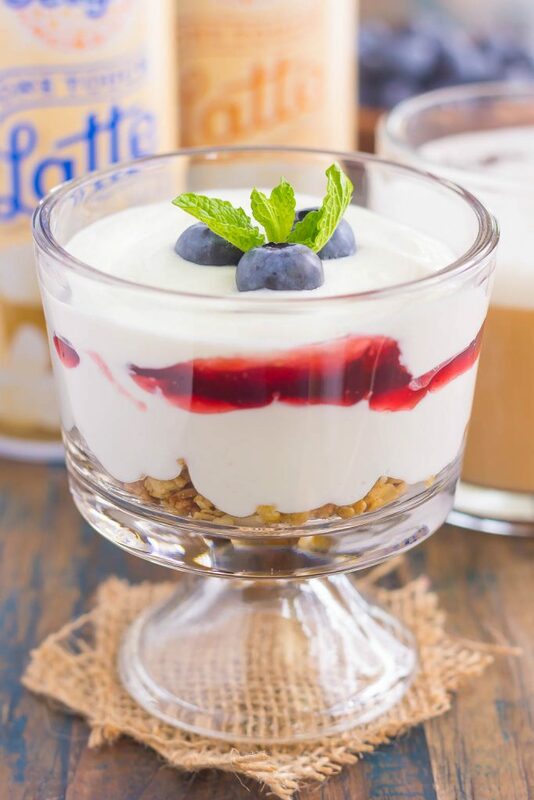 So, grab your favorite International Delight® One Touch Latte™, some coffee, and the ingredients to make this Blueberry Cheesecake Breakfast Parfait for Mother’s Day! In a medium bowl, beat Greek yogurt and cream cheese with an electric hand mixer or stand mixer for about 2 minutes until light and fluffy. Set aside. Ad 1/2 cup of granola to the bottom of two small glasses or bowls. Top with 1/2 cup yogurt mixture, followed by 3 tablespoons blueberry jam, and 1/2 cup of yogurt mixture. Garnish with fresh blueberries and a mint leave, if desired. If blueberry jam is too hard to spread, spoon into a small bowl and microwave for 10-15 seconds to soften. Like what you see? 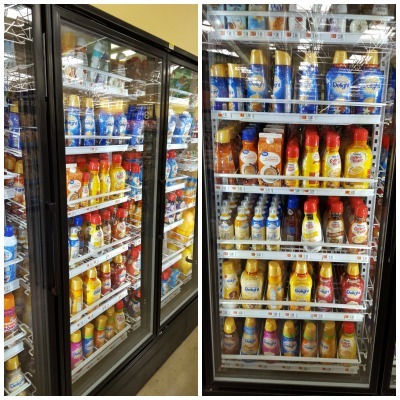 Then be sure to head to your nearest Walmart to check out their selection of International Delight® One Touch Latte™! These parfaits would be SO perfect for the upcoming Mother's Day weekend!! You can't ever go wrong with blueberry cheesecake! This parfait is such a perfect complement to a Mother's Day latte! :) Such a pretty and flavorful brunch idea. I want to wake up to this on Sunday! Thanks, Blair! It's so easy to make, too! These breakfast parfaits look like the perfect addition to Mother's Day brunch! So pretty, yet so easy! What a perfect Mother's Day recipe, Gayle! So pretty and simple too. I love the greek yogurt/cream cheese combo - I bet it's yummy! Thanks for the cheesecake love, Keri! It's delicious! Parfaits are so pretty and delicious, making them a perfect choice for Mother's Day! Love these flavors!! Yes! Every day needs to start with coffee (multiple in my case). Girl, I am loving this recipe! Basically cheese cake for breakfast? Yes, please! Love that you used blueberry jam here to and it's pretty much customizable with whatever jam is on hand (though, blueberry is my fave :) ). Pinned! Love to make a batch of these and have ready to go on busy mornings! Thanks for another awesome one, Gayle! Every day MUST start with coffee...nobody wants to be around me if I don't have it! 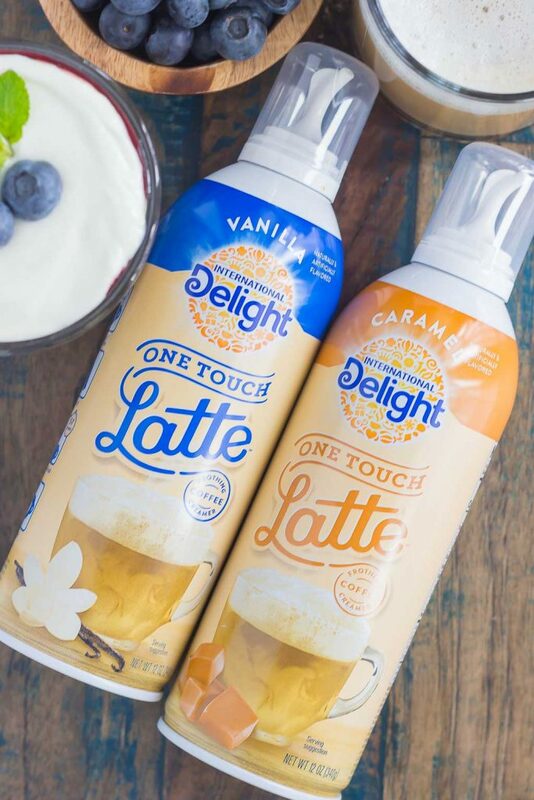 I've never seen the one touch latte -- that's such a great idea! And I'm all over Greek yogurt cheesecake for breakfast. These trifles are definitely something that I would love waking up to for Mother's Day (or any day)! Haha I know what you mean! Thanks for the sweet comment, Marcie! Yup for sure! My morning coffee is one of my favorite parts of the day! This breakfast parfait sounds sooo good! Blueberry + cheesecake?? You just can't go wrong! Hope you're having a great week Gayle! Thanks for the sweet comment, Ashley! Hope you have a great weekend! YES to coffee! AND YES to creamers. I absolutely need to try that One Touch Latte! I bet that adds a huge burst of flavor! LOVING these parfaits, Gayle!! I'm swooning over the fact that you lightened up these cheesecake parfaits with Greek yogurt!!!! Plus those blueberries?! GIMME! I'm craving this for breakfast right now! Pinned! Cheers, friend! The One Touch Latte is so fun! It really gives coffee a great burst of flavor. Thanks for the cheesecake love and pin, friend! These look perfect for Mother's Day! I'm with Chey, I love the lightness of the Greek yogurt! 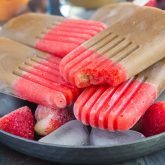 I may even add in some strawberries because whatever we're getting around here is amazing! !